I can appreciate that Natural Resources Wales/Cyfoeth Naturiol Cymru officers are sincere in their efforts to creat conditions that help to diversify species. Many varieties of Homo Sapiens are species with a deep longing for the untroubled, empty wild. Newborough beach is a wonder, as are the sand-dunes and the littoral landscape just behind them. A couple of years ago "they" (?Forestry Commission?) decided to enlarge and make more urban-looking the already perfectly adequate car park, and they also allowed one or two refreshmant vans/kiosks to trade. So the area has already become significantly less wild and peaceful. It seems to be harder to let a place be itself than to prettify it and make it less distinctive. 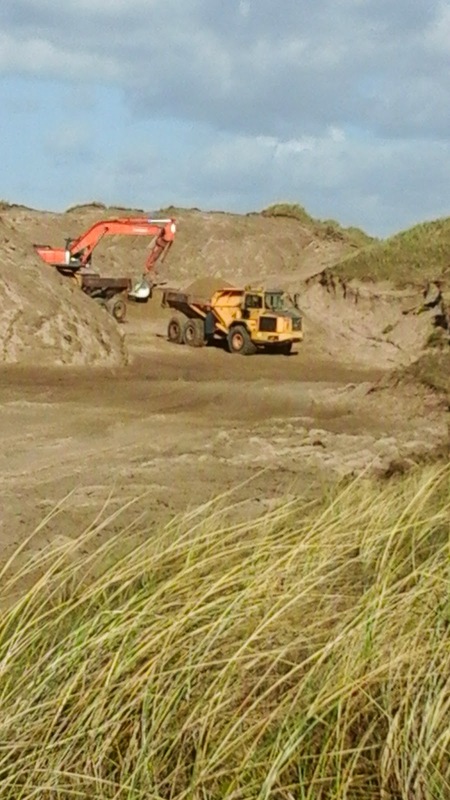 Now NRW have decided to bulldoze huge amounts of sand around, disfiguring the landscape and wrecking the peace and quiet that remained. These works are no doubt temporary, and will heal, sort of. Hopefully, rare species will thrive. It's an interesting dynamic. NRW presumably wants to drive up the number of species in order to justify its funding - and because it believes in diversification. Old gits like me would like Newborough Warren and beach to revert to a place of untroubled peace and beauty - somewhere I can listen to What the Water Says. 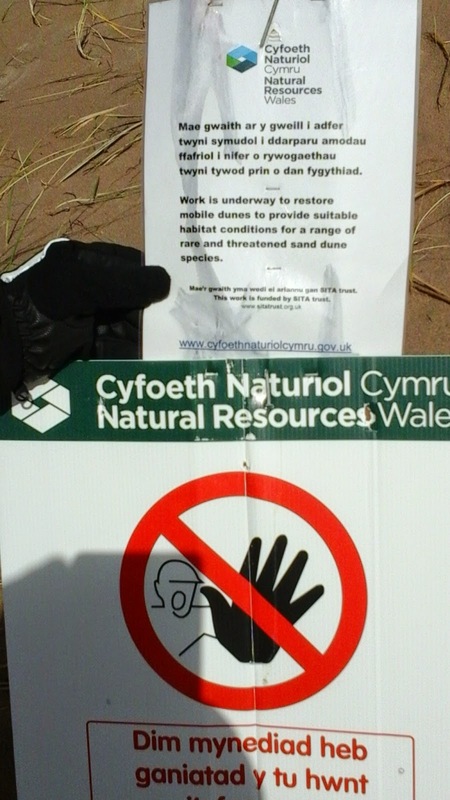 There are a lot of threats to species around Newborough (car parks, noise, careless visitors) that may be as significant as the shape of the dunes - I wouldn't know. Places like Newborough belong to the people who value them for what they are, not as a basis for environmental experiements. As far as I'm concerned, and I'm sorry for threatened species, I fear the water might be saying "piss off out of it, NRW." Bulldozed unspoilt nature. There's a contradiction there if only I could put my finger on it. Can't believe how awful that destruction looks...and is. Or that it's needed. I really hope it'll prove to be justified. At the moment Blodawel, it's difficult to give them (CNC) the benefit of the doubt, I'm finding! I can't bring myself to go back there yet, I'll stick to the Abermenai part of the Warren. Be ydy "bloody vandals" yn Cymraeg? Maybe that's unfair, we'll have to wait and see.